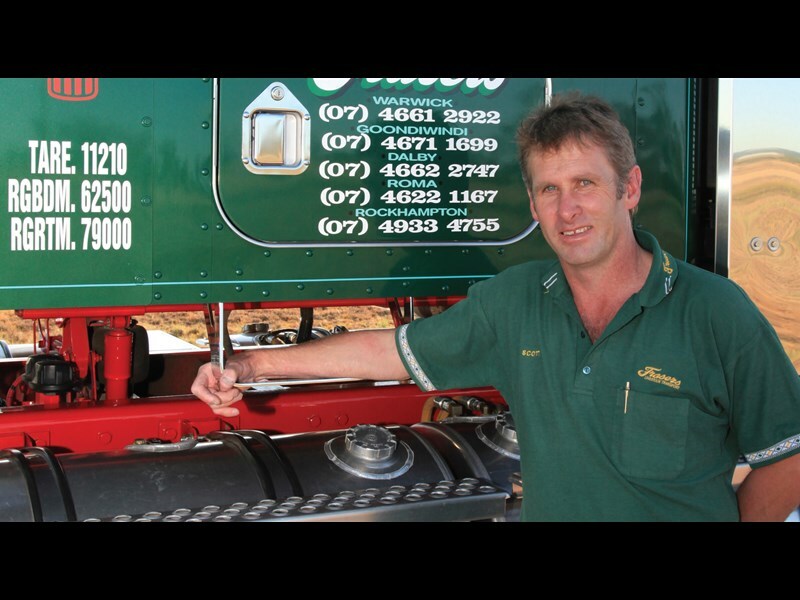 Scott Warden drives a Kenworth T659 for Frasers Transport and has enjoyed a long association with the company. His father, Robert, was the manager at the Dunlop dealership in Warwick. "That is how our family met Frasers, I was three back then. Frasers bought Tom Woods Stock Transport from Goondiwindi in about 1984 and the family moved there so Dad could run the depot. I moved out there and worked in the workshop," recalls the now 45-year-old. When Scott started in Goondiwindi both of his parents worked in the office. He was a roustabout and went out with the drivers and helped the mechanic. Scott left for 10 years but returned in 1999 to work in the Warwick workshop as a welder. Even when he left he would come back on his days off. "I drove trucks at night; delivering sheep and cattle. A driver was going on holidays and I knew that he was going to leave Frasers so I said that I would drive while the driver was on leave. He left and Frasers said that I might as well stay in the truck, which was a Kenworth Aerodyne," he says. Back then it was the early days of B-doubles. Scott was running two 33ft (10m) crates and needed the Aerodyne to pull it. After nine years driving for Frasers, Scott left to drive for Martins where he stayed for two years before returning to Frasers again. "They say that the grass is always greener on the other side of the fence. Well as you know that isn’t always the case; Frasers look after their gear, it is always well maintained," he says. There is no doubt Scott loves trucks; the T658 has more chrome than the majority of the fleet. "I love trucks. That’s what I do on the weekends, wash it. I like them to look smart. I think it reflects on your professionalism. We have pride in what we operate and how we operate," he offers. As long as he asks beforehand, Scott has the okay to do almost anything. And he likes good-looking gear with lots of chrome. He has had three brand new Kenworths and his current mount is two years-old. Scott says the latest Kenworths have 50-inch (1.27m) sleepers, super singles, adjustable steering columns and air-conditioning. Spending nearly all day in a truck on Queensland roads has been made better with improved suspensions, in particular air-bags, he adds. The T659 rides on six-rod suspension while the trailers have air-bag suspension. "The combination of the six rod and air-bag keeps it standing up pretty well. The big six up front keep it straight and steady. The air-bag trailers don’t knock the cattle around as much as spring, they ride really well. Some operators like springs; you don’t have to worry about holes in the air-bags or the air-bags not pumping up but the air-bags are nowhere near as rough," he says. 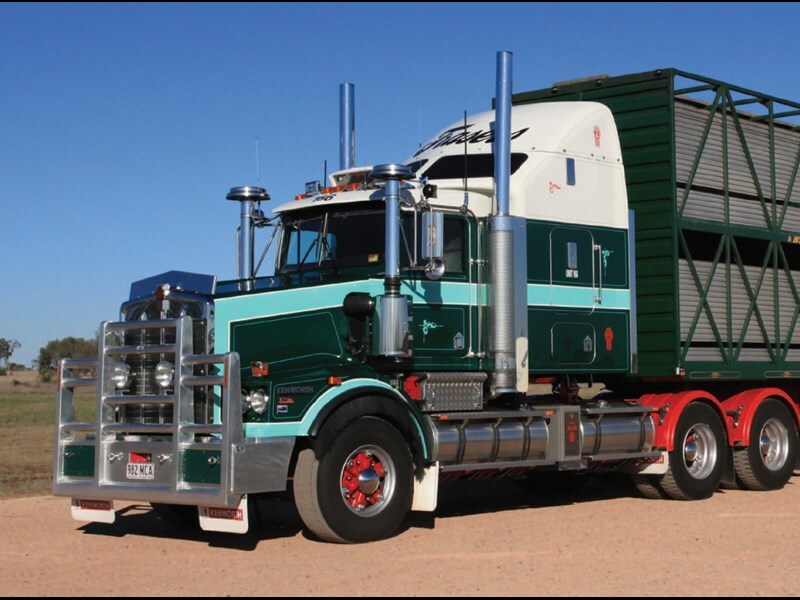 The T659 is a huge improvement on the first truck he drove carting grain in Goondiwindi — a 3233 Mercedes-Benz cabover. "I drove that for a year. It was one of the first jobs I had in between, during that 10-year break from Frasers. It was a good experience carting grain. It was my first full-time truck driving job. "I worked and drove trucks for a number of companies, all good experiences, but on my rostered day off I used to go with these fellas [from Frasers]. I would come in and do any jobs for them — drive, wash them, help them load and go to sales with my father and help him load trucks after the sales," he says. While Scott started out with an AB-double, today he regularly pulls a 20/30/40 combination. "They have regulated road trains in some circumstances. They tow really well and very straight. They are easy to back," he says. When Owner//Driver spoke to Scott he was leaving for Muttaburra to load a B-double and deliver to an abattoir in Rockhampton. "It is a good life doing the cattle. It’s just more laid back. Generally, you are working with good, honest bush people and they are genuine people. They will help you if they can should you encounter any trouble. It’s country work, you are not in the traffic running down the coast, on the Pacific or New England highways. Only occasionally do we go down there, but not often — only a couple of times a year," he says. While Scott only gets to be home one or two nights a week, he passes through his home town of Toowoomba fairly regularly. His wife, Kristy, tolerates a lot being a truck driver’s wife but it allows him to do what he loves. Scott, who lives in Toowoomba, loves trucks so much he has even named his son, Mack, after a truck. He says one of the best parts of the job is not knowing where he will be sent next. "I don’t know where I will be going from day to day. It’s something different all the time. But I like the job. It’s not so rushed, it’s not express. It does get busy but Frasers like their drivers to have a good break so we are generally off the road between midnight and seven in the morning. I don’t have to drive all night," he explains. "Frasers always give you a day to get out there, a night off and then you come back. They always give plenty of time to go anywhere so there isn’t any drama." Unlike many operators, Scott doesn’t cart his own hot plate and cooking gear with him, believing in supporting the local road houses. "Sometimes people complain that the road houses are closing, but if you don’t support them, they will continue to close. You have to support them. A lot of times, they will do your washing for you if you ask. "In a roadhouse, you can sit down and watch TV and relax a bit. You don’t have to do the dishes, which is something I don’t like doing. You can relax and talk to the other fellas. "You sit in your truck alone all day, so it is good to talk when you get the chance," he says. Looking to the future, Scott sees himself in the office. But, at the moment he is very happy to be out on the road driving. 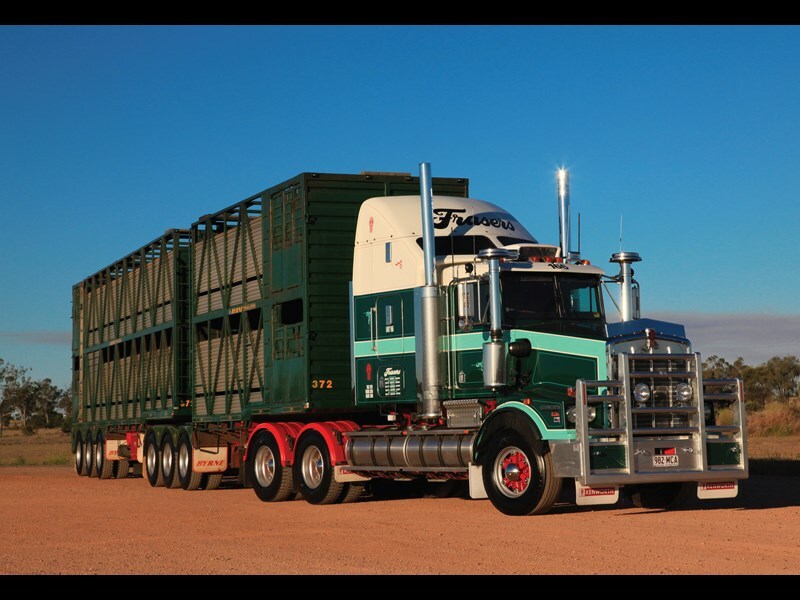 "It’s good to have learnt a lot but it’s one thing to go and load cattle and move them out, but it is much different to booking them, organising loads, trucks and drivers. I am very happy to be able to do what I love — drive trucks and to do it for a good company. It doesn’t get much better," he smiles. 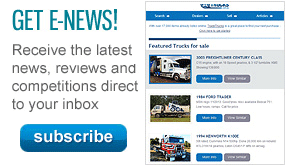 Find a Kenworth T659 truck for sale. 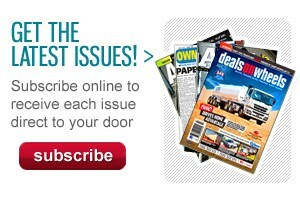 Search for specs for a Kenworth T659.